You can remove mold growth from most solid surfaces, including tables, using very simple, readily available household cleaning products. Once the visible mold is removed and the table is dried out, remaining mold spores on the table should be dead. Mold requires moisture and food--mold feasts on natural substances, such as cardboard or wood, for example--and won't survive when these are removed. 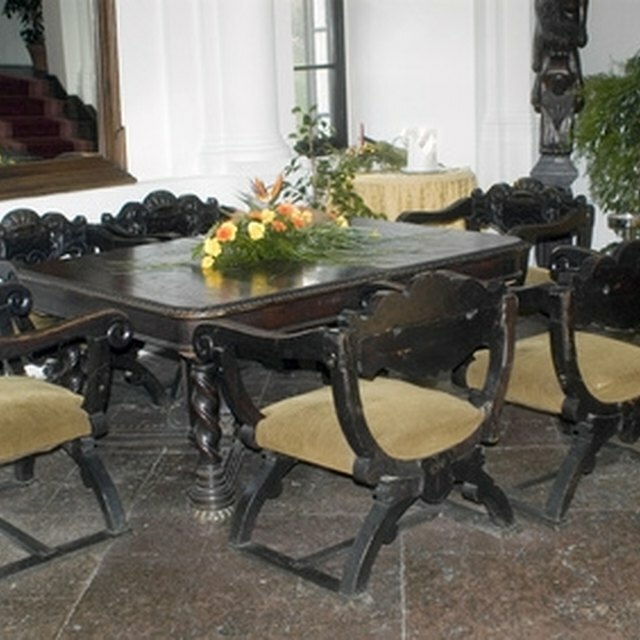 Keeping the table clean and dry will prevent future mold growth. Put on your protective gear. For cleaning mold from a table, you should wear an N-95 mask, which prevents you from breathing in mold spores, rubber gloves and protective eyewear. Goggles are best as other safety glasses do not form a seal around the eyes. Move the table outdoors, if possible. Fill a bucket, or another suitable container, with hot water and detergent if the table is made from plastic or metal. If the table is wood, use warm water. Instead of detergent, the EPA suggests using wood floor cleaner for moldy wood surfaces. Dampen a sponge in the cleaning solution. Scrub the table well to remove the mold. You may use an abrasive nylon scrubber on hard table surfaces that can handle it. You may need to rinse the sponge often in the soapy water, or use a new sponge if the sponge gets too soiled. Wash out the bucket and refill it with clean rinse water. Wipe the table downs with clean cloths and the rinse water to remove traces of cleaner. Dry the table off thoroughly with towels. If you cleaned the table indoors, direct a fan toward the table to dry it faster. If outside, let the table sit in the sunlight to dry. Sunlight works well at killing remaining mold or mildew spores. On plastic or metal table surfaces, you can use a solution of one part regular household bleach to 10 parts water to wipe away small amounts of mold or mildew. Detergent works better, however, on larger areas where mold has been growing for a while; it cleans it off more easily than bleach alone. Mold will sometimes eat through the finish on wood furniture. After cleaning, you may need to refinish these surfaces to make them look their best again. Never mix bleach with other household cleaners unless the label states it is safe to do so. Many cleaners contain ammonia; ammonia and bleach together create dangerous fumes.